Waiting for Mary, day 3 - Stop staring and start sewing! No magazine today, sniff. I did manage to keep myself distracted though by finishing and listing these fun little pretties in my etsy boutique store. 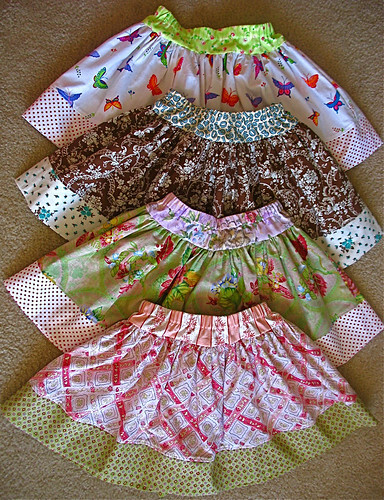 I'm trying to undo my fabric hoarding tendencies and these twirly skirts were an easy and fun way to use up some of my fun stash. 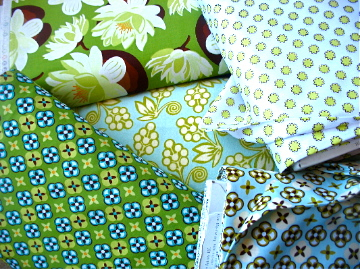 The bottom two are made from some Tracy Porter fabrics which I just adore (and it's just a quick run down to JoAnn with my coupon to get them!). But my day really got kicking when the doorbell rang and that sweet little UPS guy showed up again. 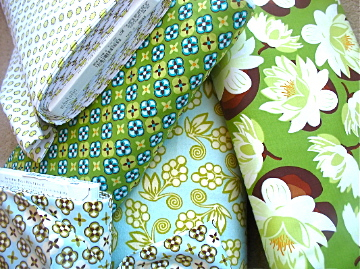 I looked out and there were 2 boxes with "Michael Miller Fabric" on them! Woohooty! I was not expecting them at all so I screamed and yelled "Thank You SO MUCH!!" to that delighted man in brown (I think he's starting to like me, why else would he bring me fabric?). 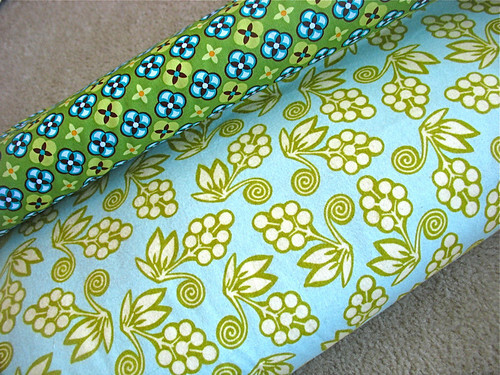 I tore the boxes open and laid my eyes on some of the prettiest fabric I've seen. It's the Ginger Blossom line designed by Sandi Henderson and it's really really gorgeous. I have to say Michael Miller does a great job because the colors are so crisp and clear and it's such soft fabric. Really nice. I was privileged to get a sneak peek of this line last year around this time and it's such a blast to have the finished product here now. I was sure I wouldn't be able to get any for my Fabritopia on etsy shop (the website's still in the works but etsy's nice for now) since I was late in ordering so I'm beyond thrilled. And I got 3 the flannel prints too! I have a friend who's expecting a boy any day now and these two will make wonderful burp rags. Lots of great colors! 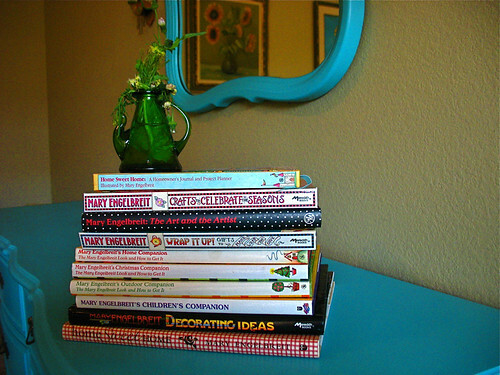 So I'm a day closer to my magazine showing up and in keeping with my Mary theme, here's a picture of some lovely little flowers my sweet 7 year old son brought me (he even arranged them!). Our back yard is full of them. Perfect.